Defying Expectations, GOP Governors Embrace Medicaid Expansion : Shots - Health News Michigan Gov. Rick Snyder said he would seek to expand the state's Medicaid program under the terms of the Affordable Care Act a day after Ohio Gov. John Kasich effectively said the same thing when he unveiled his proposed budget. Michigan Gov. 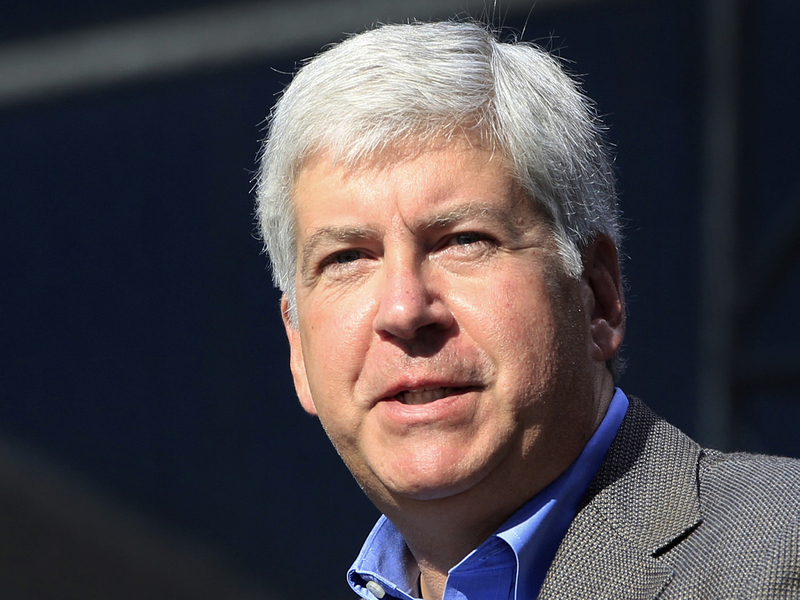 Rick Snyder, a Republican, favors a federally subsidized expansion of Medicaid in his state. Top-ranked archrivals Michigan and Ohio State faced off Wednesday night on the basketball court for the second time in this season (Michigan won in overtime to split the series). But both states' Republican governors have something more in common this week than an intense distaste for their neighboring state's athletic team. Michigan Gov. Rick Snyder said he would seek to expand the state's Medicaid program under the terms of the Affordable Care Act a day after Ohio Gov. John Kasich effectively said the same thing when he unveiled his proposed budget. Under the Affordable Care Act, the federal government will pay all of the costs of adding people to the Medicaid rolls between 2014 and 2017, phasing down eventually to 90 percent. For those who currently qualify for Medicaid, the federal matching rate is between 50 and 73 percent. That's a big chunk of money. While many Republicans had vowed to have no part of it after the Supreme Court ruled the Medicaid expansion voluntary last summer, minds seem to be changing — slowly. "This makes sense for the physical and fiscal health of Michigan," said Snyder of the decision to expand Medicaid to those with incomes up to 133 percent of the federal poverty line (about $15,000 for an individual this year). "While a complex decision, this reform not only helps improve the health of vulnerable Ohioans and frees up local funds for better mental health and addiction services, but it also helps prevent increases to health care premiums and potentially devastating impacts to local hospitals," said Kasich in his budget plan for fiscal years 2014 and 2015. "Additionally, it avoids leaving Ohioans' federal tax dollars on the table and keeps the federal government from simply giving them away to other states." Snyder and Kasich bring to six the number of GOP governors who say they will urge their states to accept the Medicaid expansion. The others include the governors of Arizona, Nevada, New Mexico, and North Dakota. But the trend isn't universal. Pennsylvania GOP Gov. Tom Corbett today declined to expand the program in his state. "The Medicaid program in Pennsylvania is on an unsustainable path," he wrote in a letter to Health and Human Services Secretary Kathleen Sebelius.